Desktop Defender 2010 is a rogue antispyware program from the same family as Contraviro and UnVirex. Once installed it will register itself in the Windows registry to run automatically when Windows starts. 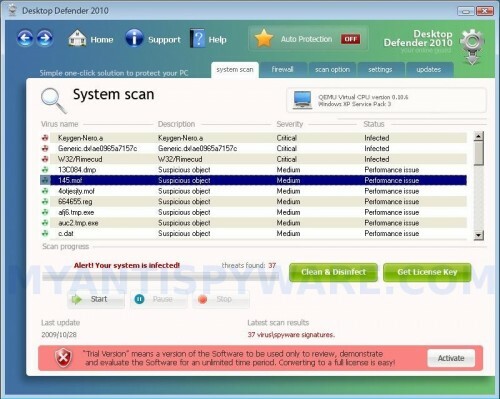 Immediately after launch, Desktop Defender 2010 will begin to scan your PC and display scan results that state the computer is infected with numerous infections, in order to trick you into thinking that your computer is infected. It hopes that you will then buy a full version of Desktop Defender 2010. It is important to know that all of these infections are fake, so you can safely ignore them. Desktop Defender 2010 stops security Windows services: Windows Firewall/Internet Connection Sharing (ICS), Security Center and Automatic Updates. Also Desktop Defender 2010 contains siglsp.dll file that will hijack Winsock LSP to watch the network traffic. Your computer is infected with spyware and malware. Last scan results: 37 infected files found! Click this notification to fix the problem. However, all of these warnings are a fake and should be ignored! If your PC is infected with the rogue, then use these removal instructions below, which will remove Desktop Defender 2010 and any other infections you may have on your computer for free. Select Perform Quick Scan, then click Scan, it will start scanning your computer for Desktop Defender 2010 infection. This procedure can take some time, so please be patient. Make sure that everything is checked, and click Remove Selected for start Desktop Defender 2010 removal process. When disinfection is completed, a log will open in Notepad and you may be prompted to Restart. I restarted and now it’s back; only now Malwarebytes isn’t detecting anything wrong. Should I run OTM again? The exe file process is still not appearing, even under all users. 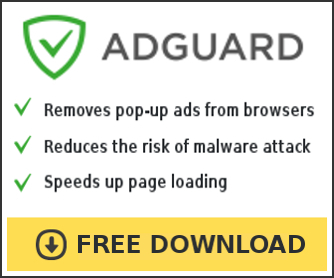 I used malwarebytes, and it got rid of desktop defender, but then it came back and now malwarebytes can’t get rid of it anymore. everytime i restart my computer after a scan, desktop defender is back. George, probably your computer is infected with an trojan that reinstalls the rogue. Ask for help in our Spyware removal forum.